People v. Urziceanu: While Prop 215 did not protect collective medical marijuana gardens or sales, SB420 HS 11362.775 did (ending in 2019). Proposition 64 Section 4. 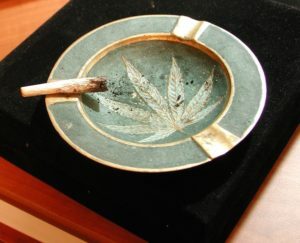 PERSONAL USE. Proposition 64 Section 9. INDUSTRIAL HEMP. 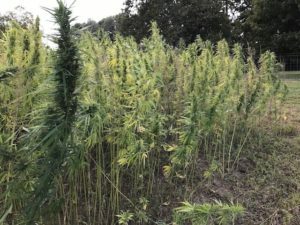 This section of the Adult Use of Marijuana Act (AUMA) provides for the production and processing of industrial hemp as a small scale to large scale agricultural crop and manufacturing resource. It allows for more groups to conduct research and allows smaller projects down to 1/10 of an acre plots (formerly 2-5 acres minimum). Summary: In 2003 the California legislature (SB420) created a limited collective defense allowing patients to grow, furnish or sell medical marijuana to one another in HS 11362.775. In 2015, it amended the program (AB243), creating a legal licensing scheme and terminating that defense effective in 2019. In 2008 the courts (People v Bergen) ruled that this defense does not apply to the use of chemical extraction in HS 11379. In 2016, the legislature (AB2679) amended to HS11362.775, adding a provision to allow local governments to license collectives to make chemical extracts. Note: Because marijuana and extracts are in the controlled substance list, because the HS 11379.6(a) chemical extraction ban is a general intent offense and because the medical marijuana laws do not list a specific protection from the chemical extraction charge, there was no defense. In 2015 the legislature passed the Medical Cannabis Regulation and Safety Act creating a dual state and local license for this activity. Friend of Prop. 64 Chris Conrad’s #yeson64 interviewed by Seattle Hempfest’s own Vivian McPeak on Cannabis Radio’s Hempresent Show. Listen in! By the time it’s over you’ll understand why it is so important to Vote Yes on 64! Are you eligible for a sentence reduction under Prop. 64? Click here for the form you need to fill out and file for dismissal and re sentencing. This should be taken to the same court where you were originally sentenced and filed with the same judge; if that judge is not available, the assignment court should send you to another court to handle this. Are you eligible for expungement? Health and Safety Code 11357.5. (a) Every person who sells, dispenses, distributes, furnishes, administers, or gives, or offers to sell, dispense, distribute, furnish, administer, or give, or possesses for sale any synthetic cannabinoid compound, or any synthetic cannabinoid derivative, to any person, is guilty of a misdemeanor, punishable by imprisonment in a county jail not to exceed six months, or by a fine not to exceed one thousand dollars ($1,000), or by both that fine and imprisonment. (1) A first offense is an infraction punishable by a fine not exceeding two hundred fifty dollars ($250). (2) A second offense is an infraction punishable by a fine not exceeding two hundred fifty dollars ($250) or a misdemeanor punishable by imprisonment in a county jail not exceeding six months, a fine not exceeding five hundred dollars ($500), or by both that fine and imprisonment. (3) A third or subsequent offense is a misdemeanor punishable by imprisonment in a county jail not exceeding six months, or by a fine not exceeding one thousand dollars ($1,000), or by both that fine and imprisonment. (1) Adamantoylindoles or adamantoylindazoles, which includes adamantyl carboxamide indoles and adamantyl carboxamide indazoles, or any compound structurally derived from 3-(1-adamantoyl)indole, 3-(1-adamantoyl)indazole, 3-(2-adamantoyl)indole, N-(1-adamantyl)-1H-indole-3-carboxamide, or N-(1-adamantyl)-1H-indazole-3-carboxamide by substitution at the nitrogen atom of the indole or indazole ring with alkyl, haloalkyl, alkenyl, cyanoalkyl, hydroxyalkyl, cycloalkylmethyl, cycloalkylethyl, 1-(N-methyl-2-piperidinyl)methyl, 2-(4-morpholinyl)ethyl, or 1-(N-methyl-2-pyrrolidinyl)methyl, 1-(N-methyl-3-morpholinyl)methyl, or (tetrahydropyran-4-yl)methyl group, whether or not further substituted in the indole or indazole ring to any extent and whether or not substituted in the adamantyl ring to any extent, including, but not limited to, 2NE1, 5F-AKB-48, AB-001, AKB-48, AM-1248, JWH-018 adamantyl carboxamide, STS-135. (2) Benzoylindoles, which includes any compound structurally derived from a 3-(benzoyl)indole structure with substitution at the nitrogen atom of the indole ring with alkyl, haloalkyl, cyanoalkyl, hydroxyalkyl, alkenyl, cycloalkylmethyl, cycloalkylethyl, 1-(N-methyl-2-piperidinyl)methyl, 2-(4-morpholinyl)ethyl, or 1-(N-methyl-2-pyrrolidinyl)methyl, 1-(N-methyl-3-morpholinyl)methyl, or (tetrahydropyran-4-yl)methyl group, whether or not further substituted in the indole ring to any extent and whether or not substituted in the phenyl ring to any extent, including, but not limited to, AM-630, AM-661, AM-679, AM-694, AM-1241, AM-2233, RCS-4, WIN 48,098 (Pravadoline). (3) Cyclohexylphenols, which includes any compound structurally derived from 2-(3-hydroxycyclohexyl)phenol by substitution at the 5-position of the phenolic ring by alkyl, haloalkyl, cyanoalkyl, hydroxyalkyl, alkenyl, cycloalkylmethyl, cycloalkylethyl, 1-(N-methyl-2-piperidinyl)methyl, 2-(4-morpholinyl)ethyl, or 1-(N-methyl-2-pyrrolidinyl)methyl, 1-(N-methyl-3-morpholinyl)methyl, or (tetrahydropyran-4-yl)methyl group, whether or not further substituted in the cyclohexyl ring to any extent, including, but not limited to, CP 47,497, CP 55,490, CP 55,940, CP 56,667, cannabicyclohexanol. (4) Cyclopropanoylindoles, which includes any compound structurally derived from 3-(cyclopropylmethanoyl)indole, 3-(cyclopropylmethanone)indole, 3-(cyclobutylmethanone)indole or 3-(cyclopentylmethanone)indole by substitution at the nitrogen atom of the indole ring, whether or not further substituted in the indole ring to any extent, whether or not substituted on the cyclopropyl, cyclobutyl, or cyclopentyl rings to any extent. (5) Naphthoylindoles, which includes any compound structurally derived from 3-(1-naphthoyl)indole or 1H-indol-3-yl-(1-naphthyl)methane by substitution at the nitrogen atom of the indole ring by alkyl, haloalkyl, cyanoalkyl, hydroxyalkyl, alkenyl, cycloalkylmethyl, cycloalkylethyl, 1-(N-methyl-2-piperidinyl)methyl, 2-(4-morpholinyl)ethyl group, 1-(N-methyl-2-pyrrolidinyl)methyl, 1-(N-methyl-3-morpholinyl)methyl, or (tetrahydropyran-4-yl)methyl group, whether or not further substituted in the naphthyl ring to any extent, including, but not limited to, AM-678, AM-1220, AM-1221, AM-1235, AM-2201, AM-2232, EAM-2201, JWH-004, JWH-007, JWH-009, JWH-011, JWH-015, JWH-016, JWH-018, JWH-019, JWH-020, JWH-022, JWH-046, JWH-047, JWH-048, JWH-049, JWH-050, JWH-070, JWH-071, JWH-072, JWH-073, JWH-076, JWH-079, JWH-080, JWH-081, JWH-082, JWH-094, JWH-096, JWH-098, JWH-116, JWH-120, JWH-122, JWH-148, JWH-149, JWH-164, JWH-166, JWH-180, JWH-181, JWH-182, JWH-189, JWH-193, JWH-198, JWH-200, JWH-210, JWH-211, JWH-212, JWH-213, JWH-234, JWH-235, JWH-236, JWH-239, JWH-240, JWH-241, JWH-242, JWH-258, JWH-262, JWH-386, JWH-387, JWH-394, JWH-395, JWH-397, JWH-398, JWH-399, JWH-400, JWH-412, JWH-413, JWH-414, JWH-415, JWH-424, MAM-2201, WIN 55,212. (6) Naphthoylnaphthalenes, which includes any compound structurally derived from naphthalene-1-yl-(naphthalene-1-yl) methanone with substitutions on either of the naphthalene rings to any extent, including, but not limited to, CB-13. (7) Naphthoylpyrroles, which includes any compound structurally derived from 3-(1-naphthoyl)pyrrole by substitution at the nitrogen atom of the pyrrole ring by alkyl, haloalkyl, cyanoalkyl, hydroxyalkyl, alkenyl, cycloalkylmethyl, cycloalkylethyl, 1-(N-methyl-2-piperidinyl)methyl, 2-(4-morpholinyl)ethyl, or 1-(N-methyl-2-pyrrolidinyl)methyl, 1-(N-methyl-3-morpholinyl)methyl, or (tetrahydropyran-4-yl)methyl group, whether or not further substituted in the pyrrole ring to any extent and whether or not substituted in the naphthyl ring to any extent, including, but not limited to, JWH-030, JWH-031, JWH-145, JWH-146, JWH-147, JWH-150, JWH-156, JWH-243, JWH-244, JWH-245, JWH-246, JWH-292, JWH-293, JWH-307, JWH-308, JWH-309, JWH-346, JWH-348, JWH-363, JWH-364, JWH-365, JWH-367, JWH-368, JWH-369, JWH-370, JWH-371, JWH-373, JWH-392. (8) Naphthylmethylindenes, which includes any compound containing a naphthylideneindene structure or which is structurally derived from 1-(1-naphthylmethyl)indene with substitution at the 3-position of the indene ring by alkyl, haloalkyl, cyanoalkyl, hydroxyalkyl, alkenyl, cycloalkylmethyl, cycloalkylethyl, 1-(N-methyl-2-piperidinyl)methyl, 2-(4-morpholinyl)ethyl, or 1-(N-methyl-2-pyrrolidinyl)methyl, 1-(N-methyl-3-morpholinyl)methyl, or (tetrahydropyran-4-yl)methyl group, whether or not further substituted in the indene ring to any extent and whether or not substituted in the naphthyl ring to any extent, including, but not limited to, JWH-171, JWH-176, JWH-220. (9) Naphthylmethylindoles, which includes any compound structurally derived from an H-indol-3-yl-(1-naphthyl) methane by substitution at the nitrogen atom of the indole ring by alkyl, haloalkyl, cyanoalkyl, hydroxyalkyl, alkenyl, cycloalkylmethyl, cycloalkylethyl, 1-(N-methyl-2-piperidinyl)methyl, 2-(4-morpholinyl)ethyl, or 1-(N-methyl-2-pyrrolidinyl)methyl, 1-(N-methyl-3-morpholinyl)methyl, or (tetrahydropyran-4-yl)methyl group, whether or not further substituted in the indole ring to any extent and whether or not substituted in the naphthyl ring to any extent, including, but not limited to, JWH-175, JWH-184, JWH-185, JWH-192, JWH-194, JWH-195, JWH-196, JWH-197, JWH-199. (10) Phenylacetylindoles, which includes any compound structurally derived from 3-phenylacetylindole by substitution at the nitrogen atom of the indole ring with alkyl, haloalkyl, cyanoalkyl, hydroxyalkyl, alkenyl, cycloalkylmethyl, cycloalkylethyl, 1-(N-methyl-2-piperidinyl)methyl, 2-(4-morpholinyl)ethyl, or 1-(N-methyl-2-pyrrolidinyl)methyl, 1-(N-methyl-3-morpholinyl)methyl, or (tetrahydropyran-4-yl)methyl group, whether or not further substituted in the indole ring to any extent and whether or not substituted in the phenyl ring to any extent, including, but not limited to, cannabipiperidiethanone, JWH-167, JWH-201, JWH-202, JWH-203, JWH-204, JWH-205, JWH-206, JWH-207, JWH-208, JWH-209, JWH-237, JWH-248, JWH-249, JWH-250, JWH-251, JWH-253, JWH-302, JWH-303, JWH-304, JWH-305, JWH-306, JWH-311, JWH-312, JWH-313, JWH-314, JWH-315, JWH-316, RCS-8. (11) Quinolinylindolecarboxylates, which includes any compound structurally derived from quinolin-8-yl-1H-indole-3-carboxylate by substitution at the nitrogen atom of the indole ring with alkyl, haloalkyl, benzyl, halobenzyl, alkenyl, haloalkenyl, alkoxy, cyanoalkyl, hydroxyalkyl, cycloalkylmethyl, cycloalkylethyl, (N-methylpiperidin-2-yl)alkyl, (4-tetrahydropyran)alkyl, or 2-(4-morpholinyl)alkyl, whether or not further substituted in the indole ring to any extent, whether or not substituted in the quinoline ring to any extent, including, but not limited to, BB-22, 5-Fluoro-PB-22, PB-22. (12) Tetramethylcyclopropanoylindoles, which includes any compound structurally derived from 3-tetramethylcyclopropanoylindole, 3-(1-tetramethylcyclopropyl)indole, 3-(2,2,3,3-tetramethylcyclopropyl)indole or 3-(2,2,3,3-tetramethylcyclopropylcarbonyl)indole with substitution at the nitrogen atom of the indole ring by an alkyl, haloalkyl, cyanoalkyl, hydroxyalkyl, alkenyl, cycloalkylmethyl, cycloalkylethyl, 1-(N-methyl-2-piperidinyl)methyl, 2-(4-morpholinyl)ethyl, 1-(N-methyl-2-pyrrolidinyl)methyl, 1-(N-methyl-3-morpholinyl)methyl, or (tetrahydropyran-4-yl)methyl group whether or not further substituted in the indole ring to any extent and whether or not substituted in the tetramethylcyclopropanoyl ring to any extent, including, but not limited to, 5-bromo-UR-144, 5-chloro-UR-144, 5-fluoro-UR-144, A-796,260, A-834,735, AB-034, UR-144, XLR11. (13) Tetramethylcyclopropane-thiazole carboxamides, which includes any compound structurally derived from 2,2,3,3-tetramethyl-N-(thiazol-2-ylidene)cyclopropanecarboxamide by substitution at the nitrogen atom of the thiazole ring by alkyl, haloalkyl, benzyl, halobenzyl, alkenyl, haloalkenyl, alkoxy, cyanoalkyl, hydroxyalkyl, cycloalkylmethyl, cycloalkylethyl, (N-methylpiperidin-2-yl)alkyl, (4-tetrahydropyran)alkyl, or 2-(4-morpholinyl)alkyl, whether or not further substituted in the thiazole ring to any extent, whether or not substituted in the tetramethylcyclopropyl ring to any extent, including, but not limited to, A-836,339. (B) AM-356, methanandamide, including (5Z,8Z,11Z,14Z)-–[ (1R)-2-hydroxy-1-methylethyl]icosa-5,8,11,14-tetraenamide and arachidonyl-1′-hydroxy-2′-propylamide. (G) AM-2389, (6aR,9R,10aR)-3-(1-hexyl-cyclobut-1-yl)-6 a,7,8,9,10,10a-hexahydro-6,6-dimethyl-6H-dibenzo[b,d]pyran-1 ,9 diol. (H) BAY 38-7271, (-)-(R)-3-(2-Hydroxymethylindanyl-4-o xy)phenyl-4,4,4-trifluorobutyl-1-sulfonate. (I) CP 50,556-1, Levonantradol, including 9-hydroxy-6-methyl-3 -[5-phenylpentan-2-yl]oxy-5,6,6a,7,8,9,10,10a-octahydrophenant hridin-1-yl]acetate; [(6S,6aR,9R, 10aR)-9-hydroxy-6-methyl-3-[ (2R)-5-phenylpentan-2-yl]oxy-5,6,6a,7,8,9,10,10a-octahydrophenanthridin-1-yl]acetate; and [9-hydroxy-6-methyl-3-[5-phenylpentan-2-yl]oxy-5,6,6a,7,8,9,10,10a-octahydrophenanthridin-1-yl]acetate. (J) HU-210, including (6aR,10aR)-9-(hydroxymethyl)-6,6-d imethyl-3-(2-methyloctan-2-yl)-6a,7,10,10a-tetrahydrobenzo[c] chromen-1-ol; [(6aR,10aR)-9-(hydroxymethyl)-6,6-dimethyl-3-( 2-methyl octan-2-yl)-6a,7,10,10a-tetrahydrobenzo[c]chromen-1-o l and 1,1-Dimethylheptyl-11-hydroxytetrahydrocannabinol. (K) HU-211, Dexanabinol, including (6aS, 10aS)-9-(hydroxy methyl)-6,6-dimethyl-3-(2-methyloctan-2-yl)-6a,7,10,10a-t etrahydrobenzo[c]chromen-1-ol and (6aS, 10aS)-9-(hydroxy methyl)-6,6-dimethyl- 3-(2-methyloctan-2-yl)-6a,7,10,10a-t etrahydrobenzo[c]chromen-1-ol. (N) HU-331, 3-hydroxy-2-[(1R,6R)-3-methyl-6-(1-m ethylethenyl)-2-cyclohexen-1-yl]-5-pentyl-2,5-cyclohexadiene-1 ,4-dione. (S) JWH-133 (6aR,10aR)-3-(1,1-Dimethylbutyl)-6a,7,10,10a-t etrahydro -6,6,9-trimethyl-6H-dibenzo[b,d]pyran. (T) JWH-359, (6aR,10aR)- 1-methoxy- 6,6,9-trimethyl- 3-[(2R)-1 ,1,2-trimethylbutyl]- 6a,7,10,10a-tetrahydrobenzo[c]chromene. (V) URB-602 [1,1′-Biphenyl]-3-yl-carbamic acid, cyclohexyl ester; OR cyclohexyl [1,1′-biphenyl]-3-ylcarbamate. (X) URB-937 3′-carbamoyl-6-hydroxy-[1,1′-biphenyl]-3-yl cyc lohexylcarbamate. (Y) WIN 55,212-2, including (R)-(+)-[2,3-dihydro-5-methyl-3 -(4-morpholinylmethyl)pyrrolo[1,2,3-de]-1,4-benzoxazin-6-yl]-1 -napthalenylmethanone and [2,3-Dihydro-5-methyl-3-(4-morp holinylmethyl)pyrrolo[(1,2,3-de)-1,4-benzoxazin-6-yl]-1-n apthalenylmethanone. (d) The substances or analogs of substances identified in subdivision (c) may be lawfully obtained and used for bona fide research, instruction, or analysis if that possession and use does not violate federal law. (1) Any substance for which there is an approved new drug application, as defined in Section 505 of the federal Food, Drug, and Cosmetic Act (21 U.S.C. Sec. 355) or which is generally recognized as safe and effective for use pursuant to Section 501, 502, and 503 of the federal Food, Drug, and Cosmetic Act and Title 21 of the Code of Federal Regulations. (2) With respect to a particular person, any substance for which an exemption is in effect for investigational use for that person pursuant to Section 505 of the federal Food, Drug, and Cosmetic Act (21 U.S.C. Sec. 355), to the extent that the conduct with respect to that substance is pursuant to the exemption.